A country’s tax code is integral to economic performance because its purpose is to promote economic development while raising revenue for government priorities. The tax code can make or break a domestic economy, the awareness of which has spurred most countries in the Organisation for Economic Co-operation and Development (OECD) over the past few decades to reform their codes. This has led to lower corporate and individual tax rates, in general, and has placed higher significance on broad-based taxes, such as the value-added tax. In the United States, 2018 saw the implementation of the Tax Cuts and Jobs Act, which lowered the U.S. corporate tax rate from thirty-five to twenty-one percent. According to OECD research, corporate taxes harm economic growth more than personal income taxes and consumption taxes do, but how do corporate taxes affect a country’s tax neutrality and competitiveness? The Tax Foundation released its International Tax Competitiveness Index (ITCI) for 2018 this past fall, which takes more than forty tax policy variables into consideration. The ITCI provides a highly comprehensive comparison of developed countries’ tax codes, offering insight into successful—and unsuccessful—tax models from around the world. 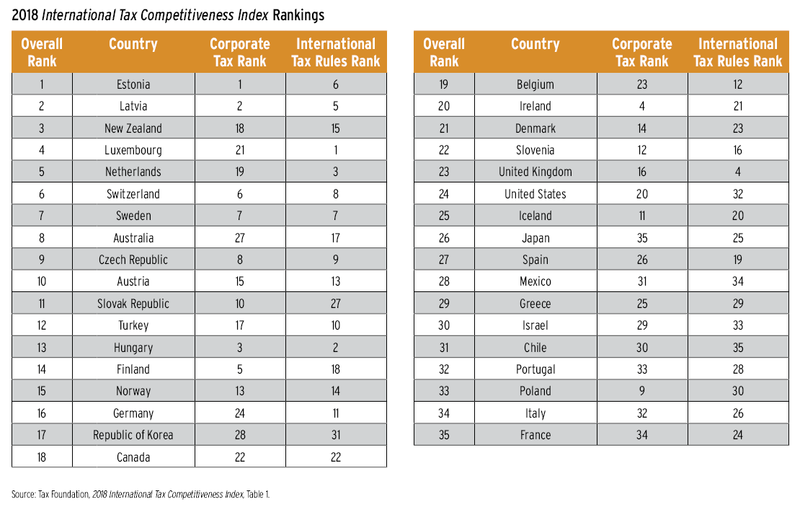 Below are the ITCI’s rankings, particularly as they relate to each country’s corporate tax rate and international tax rules. For a more thorough breakdown, visit taxfoundation.org/publications/international-tax-competitiveness-index/.